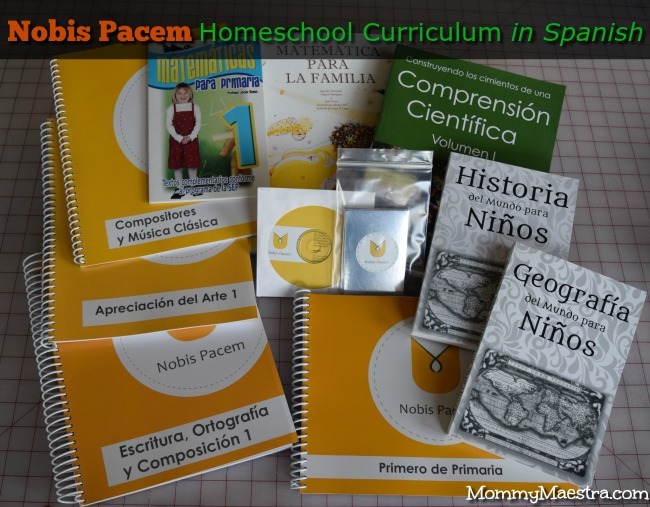 For years, people have been asking me for a complete homeschool curriculum in Spanish. And the reality has been - and still is - that there just aren't that many available or easily accessible here in the States. But there are a few out there, mainly available from other countries like Mexico. 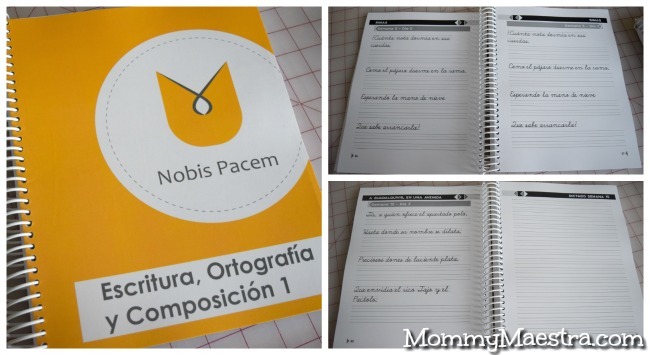 A few months ago, I was contacted by Nobis Pacem, a homeschool curriculum company out of Monterrey, Mexico, and asked to take a look at their program. 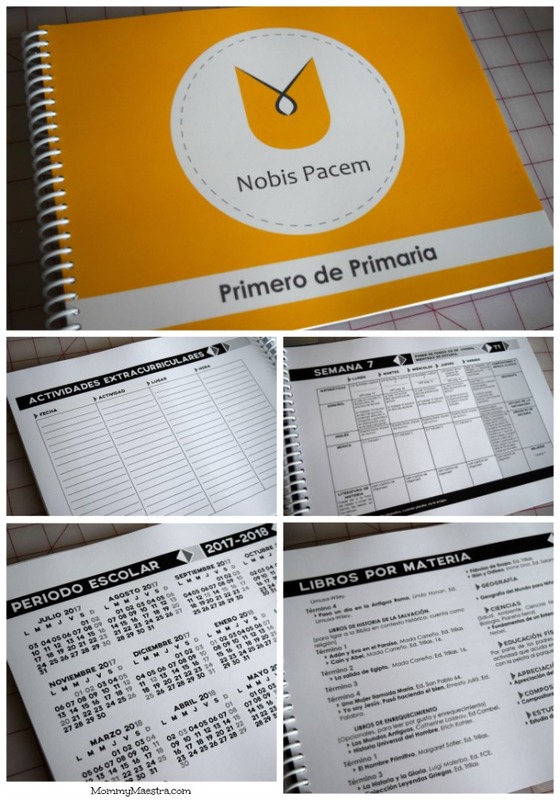 Nobis Pacem is a complete curriculum of 3 years of preschool, 6 years of primary, and 3 years of high school (which is divided school years in Mexico, but can be adapted to each country). I received a nearly complete 1st grade curriculum - the only thing missing were the history books that are typically included. And I have to say that I was very impressed by the materials. Charlotte Mason homeschoolers rely on books written by authors who are passionate about the subject, as opposed to dry textbooks. The goal is to inspire and retain, rather than indifferent memorization. So it will come as no surprise that Nobis Pacem is a COMPREHENSIVE curriculum, which I know many of you are looking for - it's meaty stuff, as you can see from the images. A lot of time and effort has gone into creating this program. Really, most of the materials are for the parent-teacher, as the level of reading is more advanced than a 1st grader can do on their own unassisted. But again, the Charlotte Mason method expects strong parental involvement. The first thing you'll want to dive into is the teacher's guide, which has lots of information to prepare parents on how to use the curriculum. You'll also find extras, such as possible meal plans, school-year calendar, and plenty of forms for helping you organize and record your progress over the year. The calendar includes indicators of Sundays and holidays. And of course, there are the actual lesson plans. I love the Apreciacion del Arte (Art Appreciation) lessons which include a biography of the artist followed by visual examples of his work. Only three artists are explored in this book, but the biographies are very thorough and each one has 10 examples of their work. In addition, there is a faint black-and-white image of each of the works that you can have your child color in staying as true to the artist's color palette as possible. 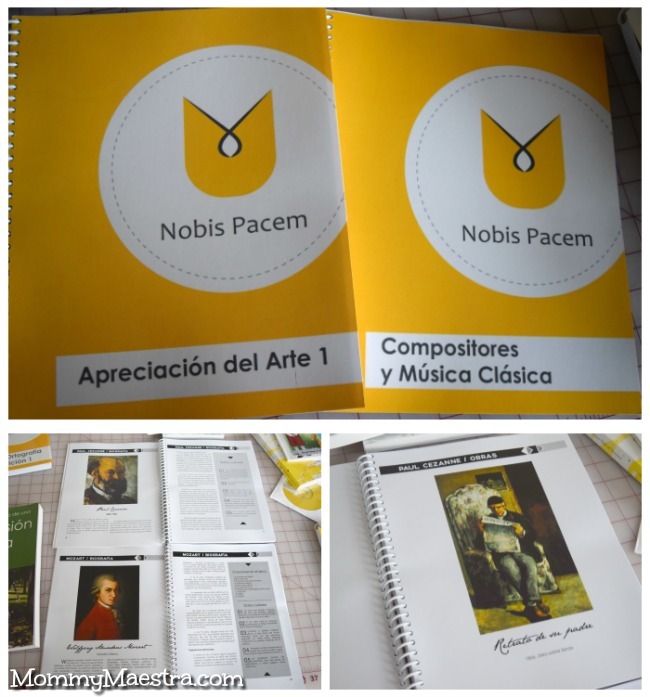 And the Compositores y Música Clásica (Composers and Classical Music) lesson book is similar with biographies for each composer. For example, you'll learn that Chopin was a composer of the Romantic Period who enjoyed acting as much as he did composing and playing the piano. He was easily inspired, but would lock himself up in his room for days to perfect his compositions. Nobis Pacem also includes a CD with music from each of the composers for you to listen to with your kids as you learn about each composer (15 in all). 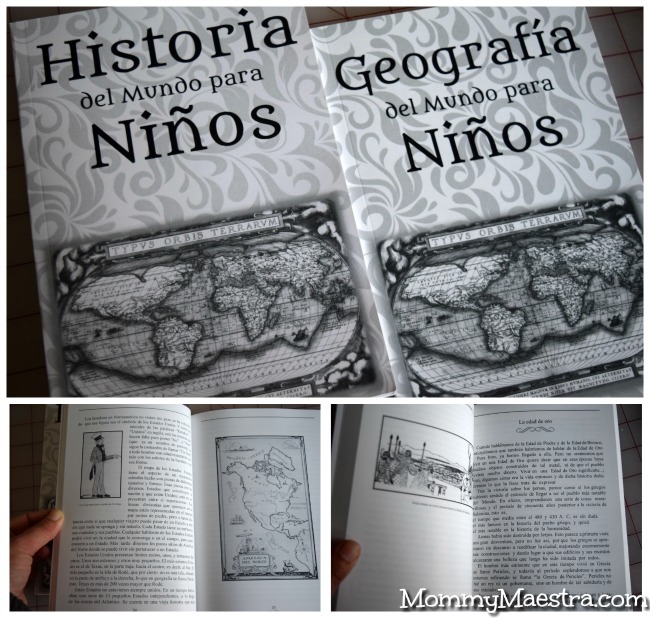 The history and geography texts are designed for reading aloud to the student. There are a few illustrations scattered about the book, but the emphasis is obvious the storyline itself. The focus for first grade is world history, beginning with the creation of the world (not bible-based) and ending with World War II. The geography book is a little different from what you might expect. It's not really about mapping, but rather about introducing children to countries around the world. If you are raising a global citizen (and I hope you are!!) then you will love this book and approach to geography. Following in the Charlotte Mason method, Escritura, Ortographía, y Composición is a workbook is made up of copywork. Students copy paragraphs and phrases/sentences to learn proper punctuation, grammar, and writing style. Personally, I prefer a good grammar curriculum that explains the various elements, such as nouns, verbs, adjectives, as well as interrogative vs. exclamatory sentences. One cool thing is how the copywork in this workbook is from famous poems - in Castilian Spanish! Actually, it's in OLD Castilian Spanish. So your child will learn madrigals, rhymes, sonnets, and other poetry by renown authors such as Gutierre de Cetina, Lope de Vega, Juan de Arguijo, and others. 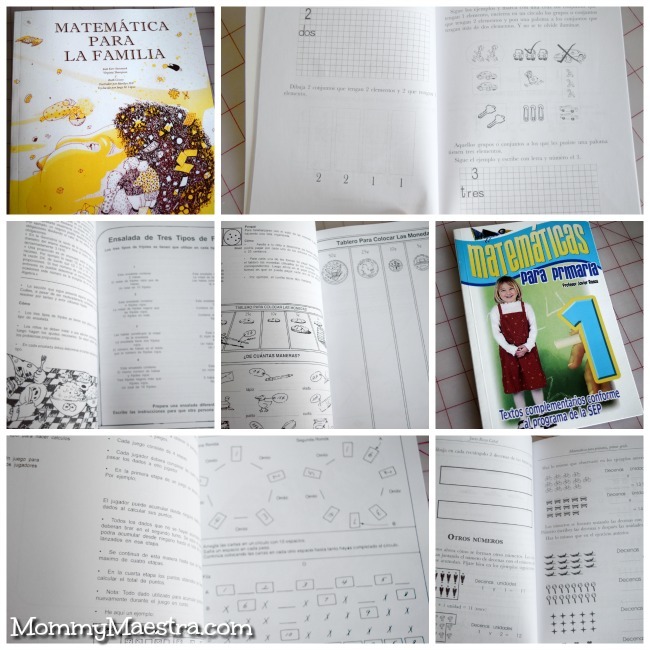 Matemática para la familia (Mathematics for the Family) is an activity-based book. Each lesson lists the materials needed, the objective(s), and instructions. The smaller Matemáticas para primaria is a little workbook for your child to complete on their own. Although they are based in Mexico, they ship worldwide. And they do offer a US accreditation, which is valid in Mexico as well. All this said, the curriculum is a bit pricey - but reasonable compared to English curricula of the same caliber. You can find out more information on their website. So if you have decided to homeschool in Spanish and plan to use the Charlotte Mason method, then this might be the curriculum for you!